A casual, affordable waterfront eatery located right on the dock, specializing in fresh local seafood, beef, chicken, abundant appetizer list and many salads. Lobster is the specialty of the house. Our raw bar features fresh native Boutique Oysters. Littlenecks, Cherrystones and Shrimp. 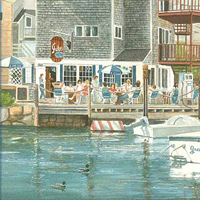 Sit right on the dock inside or out or on our vessel the “Song of Eel Pond” for lunch or dinner served 7 days a week in season (May to October). 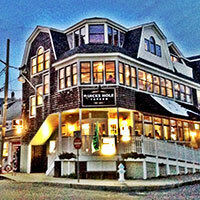 Affordably priced dinner specials. Kids plates are always available.